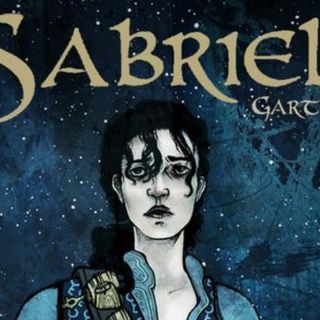 Many many thanks to Abbey for commissioning the first chapters of Sabriel by Garth Nix! I'm very excited to be getting into this whole new world with its strange rules and barriers between magical countries and non-magical ones. The prologue of this book introduces us to Sabriel's father on the night of her birth, and we get to see firsthand how his particular brand of necromancy works. She and her mother should both have died, but Abhorsen manages to snag her up from the river of ... See More death before she passed through the first gate beyond his reach. But he runs into a creepy creature called Kerrigor and I don't doubt that will be coming back up again. Then there's a time jump and we get to meet a teenage Sabriel who is at a school that feels shockingly modern considering the vibe of the world we saw in the prologue. She's a rare sort of dual-citizen, and when it looks like her father is in trouble, she packs her bags and heads into the Old Kingdom to find out what happened to him. I'm very into it, and excited to read more! Thanks so much Abbey!